In less than 24 hours, we will have our first look at all but eight NFL teams in their first preseason games. By Sunday, we will have seen every time in action at least once. Thursday’s massive preseason slate will also signify the two-week mark for most teams in training camp. With double-digit practices to work with and a seemingly unlimited amount of coachspeak predicting breakout seasons, there have been massive spikes in ADP for a host of players. It’s our job here to sift through it and notify you of all the players whose ADP no longer makes them a solid investment. Today, we’ll break down the top players at every position who are being overvalued by the public based on their early ADP — in other words the worst value at every position. Most of these players have seen a rise during training camp, but others had out of whack ADPs to begin with. Sometimes a player’s ADP jumps out right away on your first glance at any rankings list for better or worse. That’s the case with Watson for me. While a case can be made that he is slated to face one of fantasy football’s easiest schedules, the flip side over time has told us that easy and difficult schedules are hard to predict before the season. Otherwise, you’re banking on a small sample size of incredible efficiency when buying into his ADP of QB2 overall. 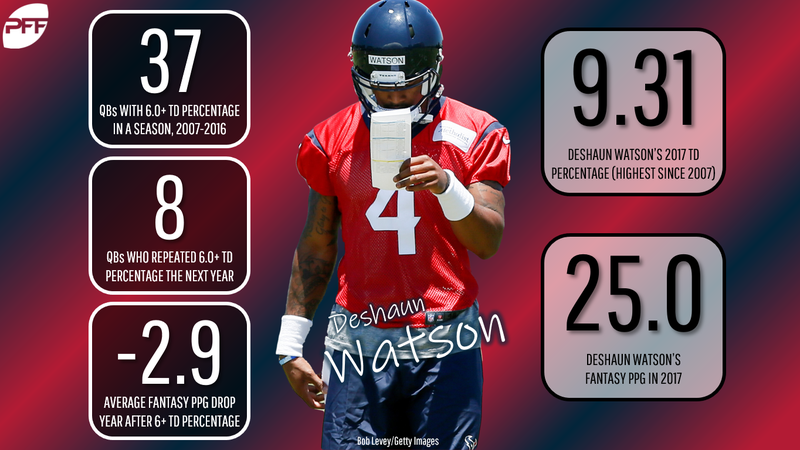 Watson averaged a ridiculous 25 fantasy points per game over his seven-game rookie season. He tacked on 0.73 fantasy points per dropback — the most of any quarterback since PFF began charting — in large part because he scored a touchdown on 9.31 percent of his total attempts — the second-best since the NFL merger, per Scott Barrett. We know that touchdown regression is real and this is a major investment to make on a player with a major touchdown outlier during a seven-game sample size. If you’re just looking at Prescott’s fantasy points per game in his two-year career, he appears to be a major bargain at his current ADP of QB17. Doing that would be avoiding the fact that Prescott regressed in 2017, and after finishing 2016 as the QB6 overall, he threw for fewer passing touchdowns, yards, and most alarmingly a lower yards per attempt. This offseason, Prescott lost his top two passing game targets — both overall and more specifically in the red zone — in Dez Bryant and Jason Witten. The Cowboys replaced them with Allen Hurns and a mid-round rookie wide receiver after missing on tight end Dallas Goedert when the Eagles swooped in ahead of them to draft him. When you throw in the fact that Prescott has been reportedly struggling throughout training camp, he becomes an easy player to avoid. Some early-August drafters feel like they’re getting an edge by drafting McCoy based on the fact that the uncertainty of his legal case has dropped his ADP and the hope that he can push the complicated trial back. Our reason for avoiding McCoy has nothing to do with his legal issues off the field — however serious they very well may be. While McCoy has succeeded as a workhorse in the past on a Bills roster lacking talent on the offensive side of the ball, he’s never done so on a roster lacking this much talent on the offensive side of the ball. In addition to losing Tyrod Taylor’s threat of a run (preventing defensive ends from crashing to the ball carrier) and his efficiency as a passer, he also lost his best two offensive linemen when both Richie Incognito and Eric Wood retired. We’re choosing to avoid the 30-year-old running back who saw 346 touches and averaged 1.4 fewer yards per carry in 2017. Avoiding Jones has nothing to do with his talent as a player. Jones earned the highest grade of any running back in all of college football in 2017. Passing on Jones has everything to do with question marks about his role in the offense. With Jameis Winston suspended for three games and a murderer’s row of opening games that includes four playoff teams in five weeks — with road games against Atlanta and New Orleans and home games against Philadelphia and Pittsburgh — the Buccaneers figure to be playing from behind often. At USC, Jones saw just 12 total targets in 2017 and 40 over the course of three seasons. Jones wasn’t used often in the passing game, and his skill set makes it possible for him to breakout with the right coaching staff, but that’s a risky proposition to make on an NFL team with a questionable offensive line that was just ranked 22nd-best and a defensive secondary that was torched often in 2017 and didn’t make any notable offseason improvements. The old style of logic would suggest because the Rams traded for and paid a hefty sum to extend Cooks, they envision him as the focal point of the offense. This logic is faulty for many factors. For starters, the offense runs through Todd Gurley, who racked up the sixth-most targets (76) of any running back in 2017. This logic is also faulty because it throws out the idea that a quarterback’s chemistry with his receivers is not important. During the Rams’ joint practices with the Raiders — as the intensity level rose with real game-like scrimmage situations — Jared Goff leaned on second-year receiver Cooper Kupp. No Rams receiver topped 100 targets in 2017 and no Rams receiver finished in the top-32 of total targets at the position. While Cooks has been incredibly efficient on a per-route basis, his ADP calls for him to be a lot more than that in 2018. The 21-year-old wide receiver put together a highlight reel of chunk-yardage touchdown games during his rookie season despite missing two games. At the same time, he finished with four receptions or fewer in nine of 14 games played. Smith-Schuster’s combination of talent, breakout age, and the offense he plays in have shot him all the way up to an ADP in the top 40 overall as a high-end WR2, but as we’ve learned, volume is king in fantasy football. It’s difficult to envision a scenario where Smith-Schuster sees the volume needed to return value on his ADP in an offense that targeted running back Le’Veon Bell 103 times (compared to 79 for Smith-Schuster) in 2017. Olsen’s history of success, his chemistry with Cam Newton, and the overall lack of depth at the tight end position have pushed up his ADP this draft season. The 33-year-old tight end says his foot is healed, but he never had surgery after last season’s fracture and he never looked the same after attempting to make a comeback from it in 2017. Olsen’s ADP has remained steady dating back to March as the TE6 and No. 58 overall player coming off the board before players like Josh Gordon, Dion Lewis, and Alshon Jeffery. Olsen may no longer be the difference maker at the tight end position he once was and we’re passing on him at this ADP.